(Un-) Welcome to Downing Street No. 10! My PhD thesis deals with the theme of „political representation“ – it’s not the actual topic, but the issue of representation constitutes the background. And political representation indeed is fun! Even though more than just sometimes, dealing with this can be a very daunting task, but what else is new. Here at my university in London I have the opportunity to get into this topic in a different manner than just my PhD thesis, that is in a course on qualitative methods, e.g. a course in which I learn all about interview techniques, analysis of documents and the like. 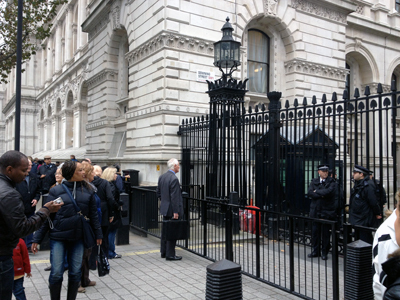 For my coursework, I conducted a participant observation in front of the gates of Downing Street No. 10, i.e. I stood in front of the site on two days for an hour each, observing what people were doing, and jotting down their behaviour and my thoughts on this. Sounds like a drag? Absolutely not! Through observation alone I got to know a lot about how people dealt with such an important site of British politics. Even though most people will be familiar with Downing Street No. 10, I would like to quickly introduce the site. Downing Street No. 10 is the home of the British Prime Minister, at the moment that is David Cameron (Conservatives). By the way, the Chancellor of the Exchequer lives just next door, at number 11. The street itself is, as one can see on the photograph, guarded from the public with a big gate and several policemen, some carrying guns. At first sight, this is not a friendly site, and one cannot help but feel that citizens are definitely not invited to come in and ‘get close’ to politics. First of all, I noted that Downing Street is most of all a tourist site. Well, that is not surprising. Many people pass everyday, a fact that is probably due to its location – if one wanted to walk from Trafalgar Square to Westminster Abbey or Big Ben, one automatically comes across it. Even more so when said walk is part of a sightseeing tour. In a nutshell, it’s conveniently situated to take a quick photograph. However, these is not much to see – the iconic black front door with the „10“ can hardly be spotted behind those big gates, and is even harder to make out on a photograph later on. Nevertheless, many people smile broadly and get their picture taken. And this is when the grim first impression gets a friendlier face. When coming closer, one can see that only the policemen inside the gates carry guns. The ones who are outside like to talk to tourists, give directions and know all about getting to the other sights in the area. And well, they are open to being photographed. When I observed the site last Saturday I could see how two happy children posed for a picture with one of the policemen. Well, that is probably every little boy’s (and girl’s?) dream, talking to a „real“ policeman. Aside from fun moments like this, I also saw things that gave me food for thought. There were many tourists who had no idea what was hidden begin those gates and who apparently only stopped because of the other people holding cameras and maps. „What’s that?“, this is what I heard more than once, and explanations rarely went beyond „this is where the Prime Minister lives“. This surprised me quite a bit. However, this lack of knowledge might result from the fact that there is not much to see – as said before, the front door of the Prime Minister can hardly be made out, and there is no sign that would tell what people could expect to see here. Everyone knows the Houses of Parliament – but it’s not the same with Downing Street. Here’s a short anecdote: a German (!) boy, probably around 12 years old, tried to explain what was to be seen to his friend, saying that this was „Oxford Street“ and that the „president“ lived here. Well, you tried, boy, but anyway, he knew the very basic facts, so that definitely counts for something, even more so because he was not British. Of course, I do not want to paint everything black and white. 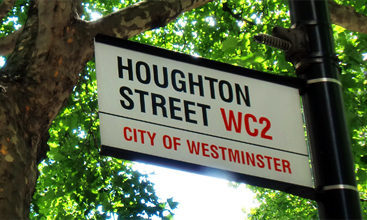 There were also people who were beaming with joy as they took a picture of the street sign and didn’t want to leave. They sure knew what was going on there. However, the majority of people furrowed their brow and left quickly. I could hear around me that people were mainly disappointed because they couldn’t go in – one of the policemen told me that this is probably the question people asl the most. Going in and walking through the street was possible before 1989, even as a normal citizen. In 1989 the well-known gates were set up due to fear of terrorist attacks, and entrance was from then on closely monitored (Downing Street 2012). The citizens have to stay out. And well, so they do. They take a picture, or not even that, and then scurry away, on to the next location of the sightseeing tour. Now, what does Downing Street represent? Is it a tourist site? Or not? I claim that Downing Street lost its appeal when the gates were built. It is probably still featured in every tourist guide, but it is hardly an educating or even nice sight. The No. 10 door can hardly be seen, and that is essentially what describes the site: There is nothing to be seen. No sign that tells people about Downing Street, nothing. It is just the home of the Prime Minister, full stop. The symbolic part vanished and was replaced with dismissive gates, that is my point on view. That the gates are there for security reasons, one the one hand, that I can understand, but on the other hand, it is not a positive image to send to citizens, as it portrays the government as not being open to the worries and demands of the people. That one could get one’s picture taken in front of the black No. 10 front door before 1989, that was great – and good for the generation of understanding and trust in politics. Of course, this was a symbolic act, but one that sticks – I could hear two women talking animatedly about their experience of walking through Downing Street as girls. This feeling is not something that the friendly policemen can compensate. Because if Downing Street becomes a place where people only stop because others do so or because they need directions, then it lost a lot of its meaning and importance. That is a pity, because for me, Downing Street is one of the most exciting places in the whole of London – and here I am, I can’t go in.